The “Pani Puri” is the most famous street snack in different states in India. It is also most common snack for the countries like Nepal, Bangladesh and Pakistan. The main ingredients to make the Pani puri are Flour, Onions, Potatoes, Chickpeas, Spicy water or Mixture water or Sweet water or Tamarind water(pani) and at last Chat Masala. 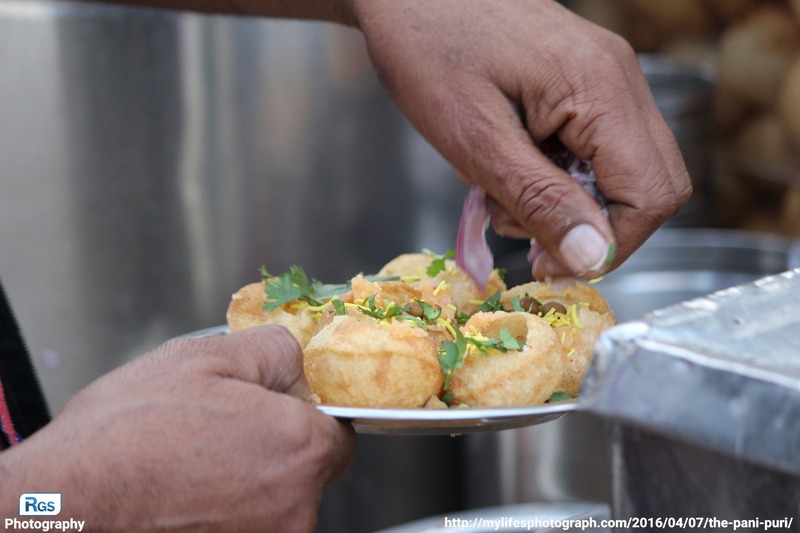 According to Wikipedia, The main origin of PaniPuri or term pani puri is recorded in 1955 and Golgappa in 1951. The Panipuri has varieties of names according the different regions and different states. In Gujarat, Andhra Pradesh, Karnatak, Maharashtra, and Tamil Nadu, It is known as Pani Puri. In Rajasthan and Uttar Pradesh, It is known as Pani ke batashe. In Punjab, Haryana and Jharkhand, it is known as Gol Gappa. In West Bengal and Assam, It is known as Puchka. In Odisha, South Jharkhand, Chhatisgarh, Hyderabad, bihar and Telangana, It is known as Gup Chup. In Madhya Pradesh and some regions of Nepal, It is known as Phulki. In Bangladesh, It is known as Puchka or fuchka. Finally In some city of Gujarat like Ahmedabad, other regions like Chhattisgarh and Odisha, It is famous as Pakodi. I captured this photo using my Canon EOS 1200D when we all the family members went to the Jamnagar. I wanna try Pani Puri. Looks like a delicious snack! Thank you for your very good website that gives information about it. Good luck! ?? i love pani puri. Thanks for shraring information. Thanks for reading and writing to post..